What our clients & participants are saying! 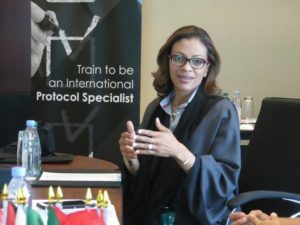 Five- Day Train to be an International Protocol Specialist, Dubai, UAE “It presented a clear picture about the pro­tocol in the world. The course content was very good and was presented in a clear logical way. I enjoyed the course very much…great in fact.” Mr. H. Al S., Government Relations Senior Specialist, His Highness, Mohamed Bin Zayed Al Nahyan. “The course for the Certified International Protocol Specialist was professionally organized. I liked everything about the presentation. Based on my previous experience, when compared to previous courses I have ever attended, I would confidently say that, the International protocol Institute of California, has a perfect approach for adult learners. M. T. S., Principal Banking Officer (PBO) – Head of Unit Protocol, Events and Guest Relations Officer, Bank of Uganda – Uganda, Africa. “Thank you for participating in the Management College Program. The event was a great success according to all of the measurements we collected, and your presentation, in particular, was a great contribution.” R. D., Event Manager, IBM. Management College. “I was delighted to be part of this exclusive training where I have learnt a lot. I felt I should have attended this training much earlier. I will surely send my team members for the next batch.”O Al M., Director – Government Relations, DP World,Dubai, U.A.E. “The Presentation “Doing Business in China,” received one of the highest ratings of the entire two-day Program. Congratulations! C.F. Ph.D, Rady School of Management, University of California, San Diego. “Your seminar covered all the important aspects of communication both inside and outside the office. The IT people loved it! They will now feel more confident when meeting clients both inside and outside the office.” C. Z., Pfizer, Incorporated. R.J.G, Latham & Watkins, Attorneys at Law. “Marie’s practical experiences were especially interesting to hear. I felt the program was very well done.” P. McM., Gen Probe. B. P., HNC Software Inc.
“I have thoroughly enjoyed and benefited from the program attended. Thanks to Dr. Ahmad Tahlak (Levenbert,), and Marie-Betts Johnson (IPIC), I am now officially an International Protocol Specialist. The group dynamics were great, the material was dense and diversified, and the entire experience was enriching and fun. I would highly recommend this to my colleagues and wish the team of Levenbert and IPIC all the best.” H.M Al M, Director – Al Jawaher Reception & Convention Centre, Sharjah U.A.E. “With 19 years of professional achievements, I have decided to be on a continuous personal and professional improvisation journey. Technological change is disrupting the world by every second with artificial intelligence (AI) changing careers and life as we know it. That is why I am always looking for the best training programs to update my skill set in the right way, at the right time. ‘The International Protocol Specialist’ program by LEVENBERT and IPIC stands out and I believe it has equipped me and will keep enriching leaders to access their innate ability to perform and compete in a global environment like the UAE especially when the world is becoming more unpredictable making it difficult to navigate if we didn’t sharpen the saw.” A .Al N. Director General – Government of Sharjah, Sharjah U.A.E. “I have been participating in a variety of etiquette programs lately since etiquette is considered as one of the essential element not only in our daily life but in our workplace too. Through the program conducted by Levenbert and IPIC, I have learned the importance of being aware of different protocol elements and its connection with different historical background, royalty, religions, cultures and languages. The program provides valuable insight about etiquette practices followed locally and its relevance on international scales throwing light on our personal grooming and right code of conduct with others! Being an International Protocol Specialist, the program has helped me widen my understanding of the different topics discussed during the training. I highly recommend this program.” H.Al.Y. Manager – Supreme Council For Family Affairs Department, Sharjah U.A.E. “International Protocol has always been an area which I have admired. Having been raised with distinct difference than the childhoods of many, in the State of Kuwait, there was protocol all around me. Through career life too, protocol continued to be an integral part of my life. My communication career is somehow married into protocol, be it Communication Head for a Head of State or Member of Royalty or a Minister or a CEO. The grooming was elegant, thanks to some of the best coaches and mentors in my life path. However I longed to be certified and December 2016 was a dream come true with Levenbert and International Protocol Institute of California, making it happen for me. Being certified as an International Protocol Specialist is one of my biggest dreams, being realized. Thank you Levenbert, Dubai UAE and thank you International Protocol Institute of California, USA.”E.P. Former Group Corporate Communications and PR – Senior Manager – Juma Al Majid Group, Dubai U.A.E. “The International Protocol Specialist Program conducted by Levenbert and IPIC, is one of the favorite programs I have attended so far. It equips a person with the right protocol and etiquette practices followed in different countries, and provides us with the techniques to deal “correctly” with other people and delegations from different countries and culture. In addition to that, one can clarify and get answers for any kind of misconceptions in protocol practices worldwide. Last but not the least, the overall atmosphere and the group members added an extra mile to the program experience with discussion on various real time examples and situations, making one more aware and provides knowledge about the international protocol system followed all across the world. I would like to highly recommend everyone specially from the UAE to take this program since we deal with people from different countries and culturenish it was brilliant. Well done! I am looking forward to building on all that we have discussed.” T.A., Global Investment Advisor. “I believe all of us enjoyed your class. The class was what I expected and I think a lot was learned by all.” P. L., Johnson & Johnson, Inc.
“The seminar gave us cultural awareness and sensitivity and, more importantly, showed us how to apply this for maximum business benefit. W-D 40 Company. “The class on improving customer service was of great benefit to all who attended. Your style and graciousness made everyone feel comfortable from the beginning. I particularly liked the role playing section. Content was excellent – you covered every aspect of serving our customers with utmost friendliness. I liked the Self Assessment and Post Assessment. It gave several participants the opportunity to evaluate themselves. Grammar, posture, approach to the customer, no gum-chewing, no physical demonstrations, smile, smile, smile, and so many other excellent pointers for our Ambassadors. Thank you for a superb protocol class on customer service.” V.McC., Human Resources, Toyota / Lexus, Carlsbad, California. “Marie, you were superb! Your protocol luncheon was really a hit, and the good news did travel fast. Incidentally, the scenario I relayed to you from one South American guest’s statement that your presentation was the “editorial of the meeting” did, indeed, result in an editorial to be printed soon. I personally learned a great deal- and you exposed numerous past errors!” J. D. P., D.D.S. President, International College of Prosthodontists. “I asked for unobtrusive excellence, and that’s what you gave. You worked long and hard and always delivered more than expected.” W.B., Chief of Protocol for the State of California, Diplomatic Corp Briefings. “I was in Mexico on a business trip last week testing some of your suggestions on international etiquette. It was interesting to note eye contact, hand shakes, and the exchanging of business cards. I also received phone calls from several attendees who expressed numerous compliments regarding you and the topic of your speech. Your presentation certainly made me aware of the little things that make a big difference!” K. S. K., Baker & McKenzie, Attorneys at Law. “I can’t thank you enough for the beautiful job you did on our special etiquette event for UCSD graduate students. You were gracious, not only in your presentation but also in your coordinating efforts. You truly embody what you teach. Thank you also for bringing your own visual affects, and for providing the well written publicity pieces and the useful workbook.” M. S., University of California, San Diego. “I would like to extend my thanks to you for your presentation to the participants in the Management for International Executives Program. The program was extremely successful, a fact which was due in no small part, to the quality of the instruction and the expertise and professionalism that you brought to the program.” C. M. J., Director, International Professional Programs, University of California, Riverside. “On behalf of the John Ahlers Center for International Business, I would like to specially thank you for your participation at our Ahlers Center International Business Breakfast Series. ‘Cultural Protocol.’ Your presentation and insightful comments are greatly appreciated.” Dr. G.M.G., University of San Diego. Slabaugh, Haflinger & Kuehn, Certified Public Accountants. “The knowledge and expertise you have in your field as well as your personality as a kind and giving individual are really communicated in your presentations. It is always a pleasure to listen and learn from you.” P. R. C., – World Trade Center Association, San Diego. K. L., Senior Vice President, Blue Book Publishers, Inc.
J. W., Inland Empire International Business Association. S. E. S., International Sales Administrator, BTX Electronic Genetics. “Thank you very much for speaking to us about international and office protocol. It was very informative and interesting. I heard really great feedback from members about how helpful it was. It was especially informative to the members that are seeking registration in Mexico where they are forging new paths.” C. F., San Diego Associate Member Forum American Society of Civil Engineers. Based in San Diego since 1989, the International Protocol Institute has designed hundreds of programs for top U.S. corporations, organizations, entrepreneurs and individuals. Let us customize the program that meets your specific requirements to support and advance your business development goals.